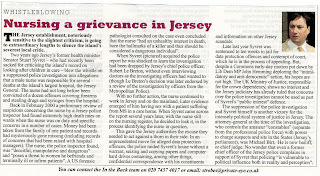 Private Eye magazine has published an article concerning events in Jersey [May, 2011]. 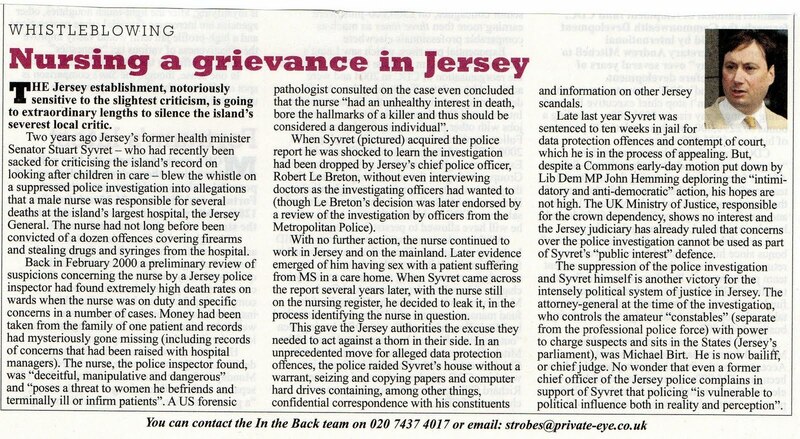 They examine another of the deeply serious crimes I exposed – in addition to my exposing of the child-abuse cover-ups – and the consequent actions taken against me by what they describe as “the intensely political system of justice in Jersey”. Click on the image to make the article expand to a readable size. Even though you’re able to read that particular article here, taken from May, 2011, I urge people to buy Private Eye. Not only is it often very funny – it is the journal to read if you want to understand what’s really going on in the dark underbelly of power in Britain. When you’re reading the following quotes from Wikipedia – just imagine – if you can – how much worse Watergate would have been – if self-enrichment – the commercial racketeering of public Office – the outright theft of public money – child abuse – the use of the actual police force as the private army of burglars – misuse of the Criminal Offences Confiscation Fund – the criminal concealment of child-abuse – the criminal concealment of clinical murder – and the suborning of the judiciary – had been involved? There are a lot of “Richard Nixons” in Jerseygate – but most prominent amongst them are the London-appointed – actually Monarch-appointed in literally pre-civil-war absolute “executive” power – succession of Attorney Generals – not least William and Philip Bailhache. For reasons that are going to become clear – they were behind the assault, aggravated burglary and theft conducted against me – as carried out by the States of Jersey police under the direction of William Bailhache & under the illegitimate, ultra vires “leadership” of David Warcup and Mick Gradwell following the overtly illegal coup against good Police Chief Graham Power. The Jersey police – obeying the orders of a personally and professionally conflicted and compromised Attorney General, William Bailhache, a man who socialised with priority child-abuse suspects, and who tried to illegally coerce Police Chief Graham Power – engaged in burglary – assault – illegal breaking and entering – the theft of the sacrosanct private communications between the Jersey public and their elected representatives. William Bailhache has now been made the head of the Jersey judiciary – and the head of the Jersey legislature – “Bailiff” – by the personal, pre-Magna Carta “executive” power of the British Monarch, as still runs in the “Crown Dependencies”, via Her personal “Letters Patent” – in spite of his evidenced gross corruptions. Jersey’s Attorney General, and a suborned police force – following the illegal suspension of Graham Power – mounting illegal raids – burglary, theft – political repression – against democratically elected representatives – against you. I genuinely wonder about the rationality of the Jersey oligarchs and their vassals – and in particular those who empower and protect them in London – the collusive “Friends At Court At Whitehall”, as the Jersey mafia unembarrassedly refer to them. This entry was posted in Uncategorized on 16/05/2011 .